Test the value and relevence of the content and advice for free. 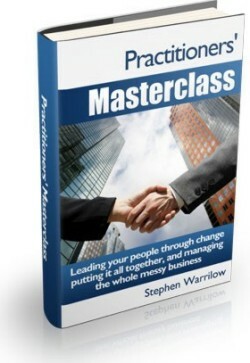 8 short lessons taken directly from the Practitioners Masterclass. Tailored for speed and ease of reading in email format. An overview of key themes and important aspects of leading and managing change and putting it all together. Each lesson is approximately 300 words. You will receive each lesson at approximately 3 day intervals. How to lead your people through change and manage the whole messy business?